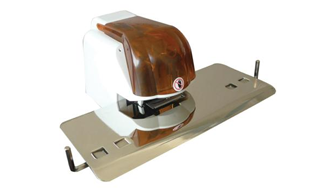 Electric Stapler 110E, simple cassette loading up to 5,000 staples. Features side gauges and adjustable throat depth, for convenient operation. Maximum stapling capacity of 70 sheets. Request a Quote or Demo. Or, request a call from one of our friendly consultants.